Archipelago Folkschool connects people with craft. We are a Community Interest Company and a collaborative social enterprise. We run short residential craft courses in beautiful places, events that teach skills but also encourage participation in communities and connection with the environment. Our approach is interdisciplinary as much as possible - our lives are not lived as neat sections so our making shouldn't be either. We work at the boundary between expression and engineering; art and science; the human built and the naturally occurring. We are inspired by folkschools around Scandinavia and America as well as the pioneering work of the GalGael Trust in Glasgow. 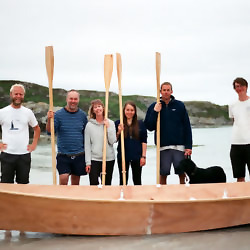 We are first and foremost boatbuilders - our courses focus around that and we also take on commissions in small craft building and repair. We have a network of great makers across Scotland however so we can also include blacksmithing, basket making and other crafts.